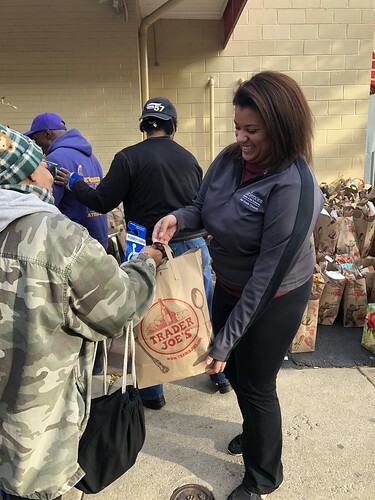 The generous donations collected by the USciences community during the sixth annual Appeal for a Meal campaign at USciences will help to feed hundreds of families in West Philadelphia this holiday weekend. Students, faculty, and staff collected the food for 461 meals to be donated to the annual campaign coordinated by the office of student life in partnership with Philadelphia City Councilwoman Jannie L. Blackwell, Dimitri Dimopoulous, the owner of Allegro Pizza, and Sodexo USA. Student clubs and organizations and various departments from across the University donated cans of fruit, stuffing, mashed potatoes, gravy, vegetables, cranberry sauce, dinner rolls and dessert to accompany the turkeys donated by Dimopoulous. Sodexo helped by providing a dessert to go along with each meal. All of the holiday staples were packed into bags donated by Trader Joes and packed into a moving truck to be transported to Allegro, where they would be picked up by families. Each bag serves four to six people. This year’s meal drive outpaced the number of meals donated in previous years including last year’s record-setting donations. The students of Phi Sigma Pi donated 73 bags, the most meals out of all the student organizations participating. The Department of Biological Sciences donated 91 bags of food, the most among the University’s departments. Both will be rewarded with a pizza party on behalf of USciences President Paul Katz.